Black Mustard is commonly seen growing along pathways, in parks and across abandoned building sites cross London and most major cities in the U.K. It is a hardy annual with lobed leaves and small, four-petalled yellow flowers. Each flower is replaced by a slender pod that divides in two parts when the plant is ready to disperse its seeds. 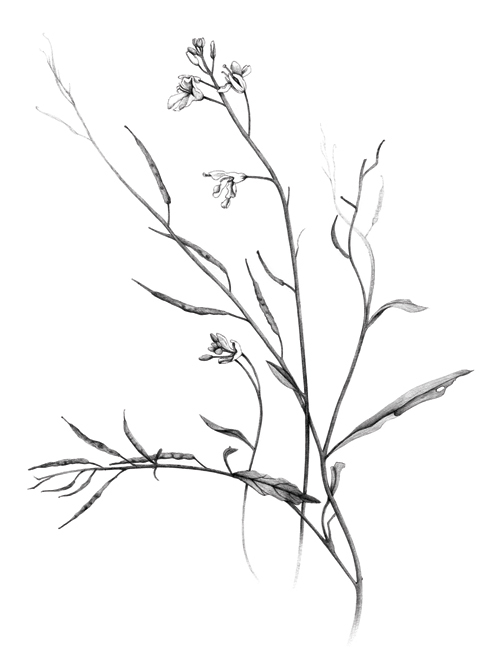 Black Mustard seeds are used to make one of the world’s most popular spices. The seeds, which can be a skin irritant, also have antibacterial properties and are traditionally used to treat rheumatism. Black Mustard is one of several reliable Brassica species that farmers regularly use as winter ground cover. Felter HW, Lloyd JU. King's Dispensatory . Portland, OR: Eclectic Medical Publications; 1983. Leung AY. Encyclopedia of Common Natural Ingredients Used in Food, Drugs, and Cosmetics . New York, NY: Wiley; 1980. Coggiola B, Pagliai F, Allegrone G, Genazzani AA, Tron GC. Synthesis and biological activity of mustard derivatives of combretastatins. Bioorg Med Chem Lett . 2005;15(15):3551-3554. Tseng E, Kamath A, Morris ME. Effect of organic isothiocyanates on the P-glycoprotein- and MRP1-mediated transport of daunomycin and vinblastine. Pharm Res . 2002;19(10):1509-1515. Kumar A, D'Souza SS, Tickoo S, Salimath BP, Singh HB. Antiangiogenic and proapoptotic activities of allyl isothiocyanate inhibit ascites tumor growth in vivo. Integr Cancer Ther . 2009;8(1):75-87. Eskin NA, Raju J, Bird RP. Novel mucilage fraction of Sinapis alba L. (mustard) reduces azoxymethane-induced colonic aberrant crypt foci formation in F344 and Zucker obese rats. Phytomedicine . 2007;14(7-8):479-485. Singh RB, Dubnov G, Niaz MA, et al. Effect of an Indo-Mediterranean diet on progression of coronary artery disease in high risk patients (Indo-Mediterranean Diet Heart Study): a randomised single-blind trial. Lancet . 2002;360(9344):1455-1461. Srinivasan K. Plant foods in the management of diabetes mellitus: spices as beneficial antidiabetic food adjuncts. Int J Food Sci Nutr . 2005;56(6):399-414. Anand P, Murali YK, Tandon V, Murthy PS, Chandra R. Insulinotropic effect of aqueous extract of Brassica nigra improves glucose homeostasis in streptozotocin induced diabetic rats. Exp Clin Endocrinol Diabetes . 2009;117(6):251-256. Grover JK, Yadav S, Vats V. Medicinal plants of India with anti-diabetic potential. J Ethnopharmacol . 2002;81(1):81-100. Silva, MB, Silva, CA, Malaquias, LCC, Sarandy, MM, Freire, MCM, Antunes. FR, Costa, A.VS. Comparative effect of a phytotherapeutic product from Brassica ssp as cicatrizing. Rev. Bras. Pl. Med. 2006; 136-138. Inoue H, Asaka T, Nagata N, Koshihara Y. Mechanism of mustard oil-induced skin inflammation in mice. Eur J Pharmacol . 1997;333(2-3):231-240.